When people think of ancient baths, most people immediately think of the Roman Baths. However, the Romans were not the only ones who discovered the soothing powers of steam rooms and hot springs. The thermal baths in Budapest, Hungary are amongst some of the greatest treasures the ancient cultures have given us. Hungary was significantly shaped by the Turks and the Ottoman Empire. The Turks created their baths similarly to the Romans. The Romans used their aquaduct system to bring water into the bath and then heated the water by fire. Then, they would have the water running under the stone floors in bricks and inside the walls to make an entire room heated. The Turks, however, used already heated water from natural hot springs instead of heating water by fire. The Thermal Baths in Budapest are similar to the Turks’ idea in that most original baths have access to water from hot springs. Each of these baths have an interesting balance between steam rooms, saunas, and swimming pools. Steam rooms were meant to cleanse both the body and the mind, while the saunas were meant to strengthen both body and mind. The swimming pools were intended as both a place to wash as well as a place to sit and relax with fellow citizens for hours on end. The water from the hot springs also has such high levels of certain minerals and low levels of toxins that the water itself is cleansing to the body. It pulls out toxins from the body while exfoliating the skin, and strengthens the body through its nutrients. Imagine giant hot tubs filled with cleansing aromas, flower petals, and candles everywhere and you’ll have an idea of what the thermal baths are like. Historically, men were almost always the only ones allowed into the baths–however, women’s baths did become more popular over the years. The women’s baths were considered a place where women could rest and cleanse from the day, but the men’s baths were considered almost like a club. 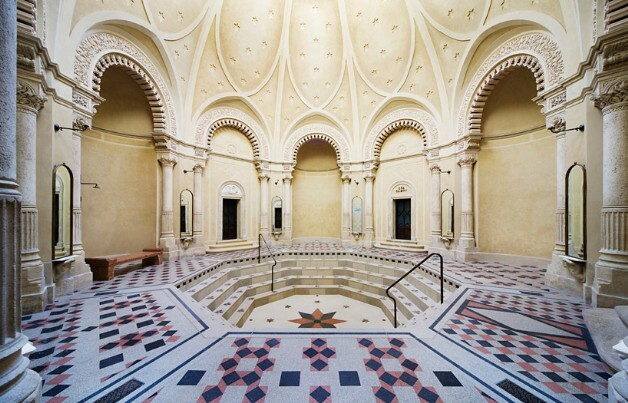 Men would spend entire days in the baths discussing politics, theology, philosophy, etc. Although today these baths aren’t used as a social function as much as they once were, many of them are still functioning and the hot springs still flow to the baths even after so many years. Places such as the thermal baths are definitely a part of history that should not be over looked. Visiting the baths and perhaps getting a bottle of natural cleansing hot springs water is the perfect way to remember Budapest and all its incredible history! Want to check out the thermal baths in Budapest for yourself? Visit Budapest & Vienna in one incredible weekend with FlorenceForFun. Click here for more info or to book now, and take a look at our website at www.florenceforfun.com to see upcoming trips.